Welcome to Bethville! : Frightening Friday: Terrifying Evil Clowns of Terror! Frightening Friday: Terrifying Evil Clowns of Terror! Welcome to Frightening Friday, a special story time that I have decided will take place every Friday this October. You will read the absolutely bloodcurdling tale I have written each week, and it will give you the scariest nightmares you've ever had. And then, I will sit here giggling over how frightened you all are while enjoying this very unfrightening PG movie I rented from Netflix and drinking hot chocolate. So, prepare yourself! For doom! And terror induced pants wetting! 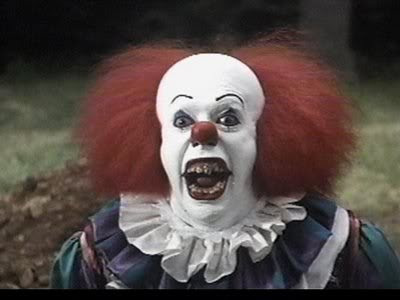 Once upon a time, there was an evil clown who terrorized children. And he was quite terrifying, from his blood red nose to the oversized shoes he wore that, when he walked, squeaked like the cries of dolphins trapped in a tuna net. He made balloon animals that exploded instantly when any child touched them, making the child weep in surprise and extreme disappointment. The clown, whose name was Buttons, also hid out in sewers and tried to coax children down there to join him forever and ever, but hardly any children ever went, except the really dumb ones. And no one missed those kids anyway. One afternoon, Buttons lit a terrifying bag of poop on fire and put it on the front porch of some small child, and the child came outside and simply looked at it in confusion. "What are you doing?" asked the unfrightened kid. "Rawr! I'm scaring you!" said Buttons. "Now come here so I can turn your intestines into the best balloon poodle ever." "You're weird," said the kid, and went back inside his house to continue building a pipe bomb. Buttons was sad. He wasn't as scary as he had originally suspected. "Kids these days! You gotta wield a chainsaw or they will just laugh at you," grumbled Buttons as he squeaked home to his sewer in disgust. But as he approached his favorite drain, he noticed something strange. There were a pair of eyes peeking out of it at him. "Hey! Hey, you," said a gruff voice. "It's me! The terrifying sewer clown, and I'm going to eat you," replied the voice. "No, you're not. I'm the terrifying sewer clown," said Buttons. "Who are you?" "What are you doing in my sewer drain?" asked Buttons. "Okay, you caught me," said the voice, "I'm the terrifying clown from the circulation desk at the library, but every time I say, 'I'm gonna eat you, kid!' the librarian tells me to be quiet. So I decided to move down here where it's more scary and less shushy." "Well, I already live there, so you'll have to find another place to terrorize children," said Buttons. "All right. I guess I'll do that," said the other clown, whose name was Clover. As Clover crawled out of the sewer drain and skipped away to a place where he could be more terrifying, Buttons stared at the pink suspenders and rosy cheeks that Clover wore and realized that he was fifteen times more terrifying than that guy. It didn't matter that one kid didn't think he was scary. So, from that day onward, Buttons became the scariest clown who ever lived. He popped out of the closets of all the young people with blood dripping from his eyes. He threatened to gut children with his extremely large and extremely sharp balloon chainsaw. And he lit bags of poop on fire with a blow torch that expelled the flames of hell. All the children who had previously thought he was stupid became extremely frightened and needed therapy for many years afterwards. It should be noted that Buttons had no sense of smell, and did not realize that part of what made him so scary was that he hung out in sewers and lit poop on fire. But he was happy anyway. Coulrophobia is abnormal or exaggerated fear of clowns. Thanks for that. @JPC: For writing a hilarious and completely non terrifying story about evil clowns? Or for the picture that I posted with it that sent you into a terror stricken frenzy? for me, the reason the movie IT was never scary was not because tim curry played in HOME ALONE 2, but because he was in MUPPET'S TREASURE ISLAND. and nothing is less scary than tim curry dressed as a pirate and singing angrily as muppets thwart his attempts to thief and plunder on the high seas. @jody! : I love Muppets Treasure Island.